A frustrated GP receptionist has claimed that patients should stop wasting doctors' time with minor headaches and buy painkillers over the counter, 'instead of a pack of cigarettes'. 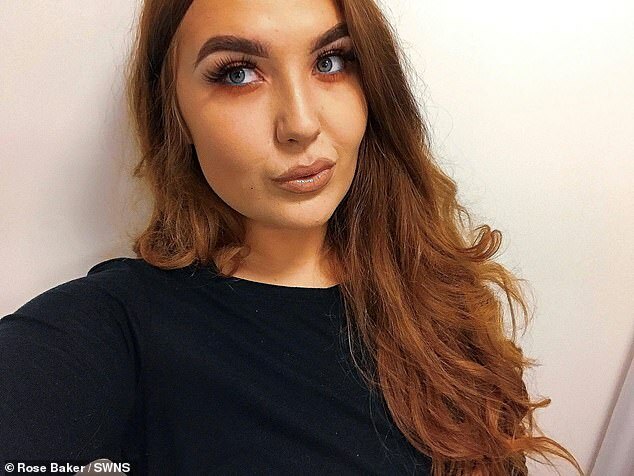 Rose Baker, 24, from Sheffield, urged 'moaning' patients to 'take a second to think before you s*** us all off' and complain about waiting times. Rose suggested patients should not book to see their GP if they have 'a bit of a cold', adding that they 'should spend 15p on over the counter paracetamol instead of a pack of 20 sterling dual cigarettes'. She said she had to take to social media after witnessing disgruntled patients criticising the 'failing NHS' and not being able to get appointments at 8am. The 24-year-old also responded to patients who criticise her for asking why they need to see a doctor. 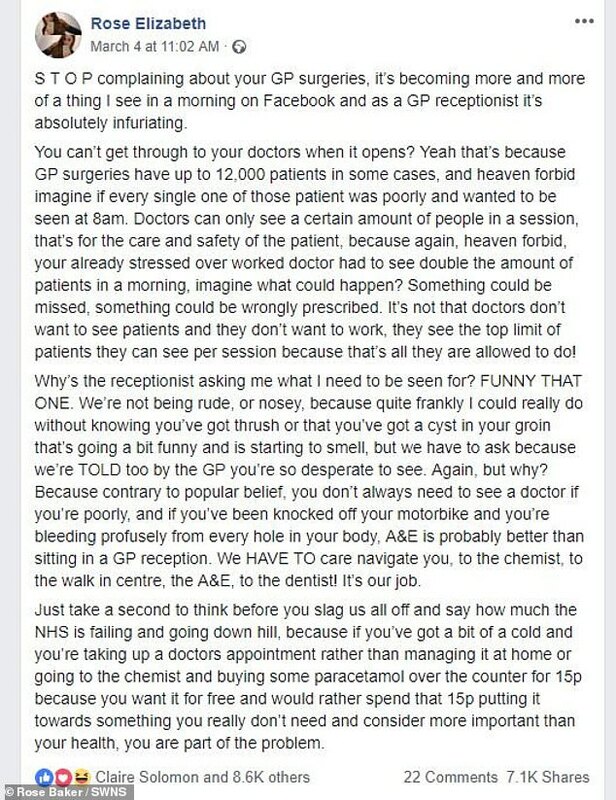 The post from earlier this month read: 'STOP complaining about your GP surgeries, it's becoming more and more of a thing I see in a morning on Facebook and as a GP receptionist it's absolutely infuriating. 'You can't get through to your doctors when it opens? Yeah that's because GP surgeries have up to 12,000 patients in some cases, and, heaven forbid, imagine if every single one of those patient was poorly and wanted to be seen at 8am. 'Doctors can only see a certain amount of people in a session, that's for the care and safety of the patient, because again, heaven forbid, your already stressed over worked doctor had to see double the amount of patients in a morning, imagine what could happen? She continued her rant by criticising patients who think receptionists are being nosy or rude when they ask why they need to see a doctor. Rose said: '''Why's the receptionist asking me what I need to be seen for?'' FUNNY THAT ONE. 'We're not being rude, or nosy, because quite frankly I could really do without knowing you've got thrush or that you've got a cyst in your groin that's going a bit funny and is starting to smell, but we have to ask because we're TOLD too by the GP you're so desperate to see. 'Again, but why? Because contrary to popular belief, you don't always need to see a doctor if you're poorly, and if you've been knocked off your motorbike and you're bleeding profusely from every hole in your body, A&E is probably better than sitting in a GP reception. 'We HAVE TO care navigate you, to the chemist, to the walk in centre, the A&E, to the dentist! It's our job. 'Just take a second to think before you slag us all off and say how much the NHS is failing and going down hill. Rose, who later removed the reference to cigarettes, has since said patients needed to learn a bit about 'self care' and the different options available to them when they fall ill.
She added: 'On that morning I posted it, I had just seen about four or five stories from other people complaining about the GPs and not being able to get an appointment. 'I just got to the point where I was tired of seeing it everyday so I went on a bit of a rant. I never expected what has happened to happen. The receptionist earned a lot of support after her post went viral. However, not everyone was complimentary towards the receptionist. One person took to Twitter to comment: 'Saw this viral post and found it funny. The receptionist at my GP said they don’t see people for a mild cough when I asked for an appointment.